*and genuine mystery... but I'll get to that later. 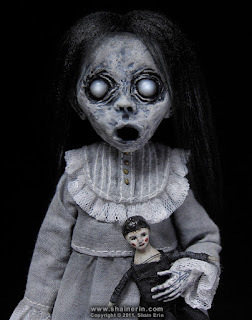 Shain Erin's Morbid Art dolls. Where do I even begin on how amazing these are? 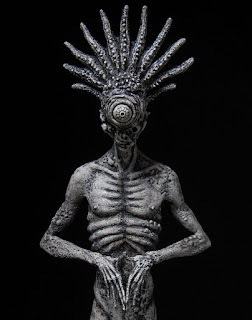 Since graduating from the San Francisco Art Institute with a BFA, Erin has used his sculpture skills to create terrifying figures that have been displayed in art shows around the world. His collections have ranged from pale ghosts reminiscent of Victorian poppets, to small withered mummies swaddled tightly in their fetishistic bindings. 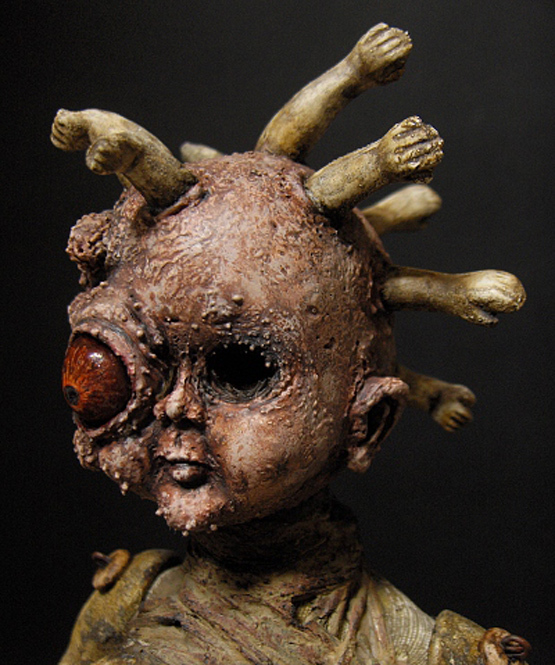 Erin boldly delves into grotequerie and monster-making, pushing the boundaries of what a "doll" is and can be. In the bio from Erin's wordpress site, he states that these toys are not meant to be comforting. Rather, they are "disturbing and enchanting, irrational and frightening, beautiful and sad." And discomforting they are. Some of the dolls are immediately spooky: the kind of thing a 13-year-old lingering outside a Hot Topic would enjoy. Very quickly, though, his work veers into the horror of severe disfigurement and mutation. Mouths gape with a snarl of huge, malformed teeth. Extra eyes, uncomfortable goiters, unreasonable cleft palates, and swollen skulls grace these figures delicately sculpted in paperclay. Eventually, the dolls, like those in the Fallen series, are reduced to vaguely humanoid lumps of scabrous flesh. But, Erin is not in the business of making mere scary dolls. 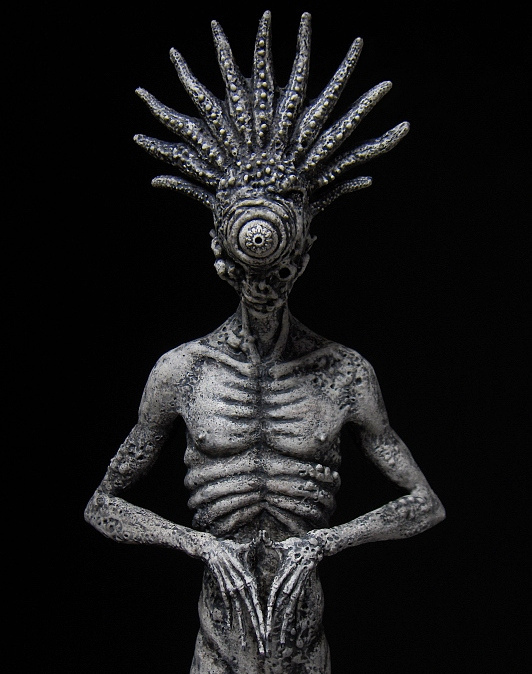 His work is deeply rooted in world art and mythology. As such, his works often aim to excavate and explore a personal mythology, creating "artifacts that never were." 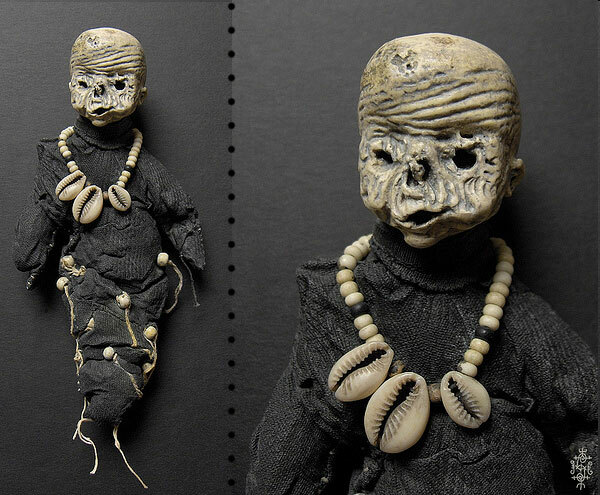 In this vein, we see his series of mummies, reminiscent of real-life tiny mummies or shrunken heads. 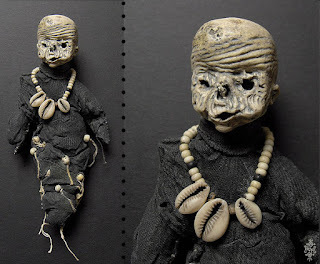 Instead of being dressed in child-like nightgowns, these mummies are given crude shifts and bead necklaces- or are tightly bound like a witch-doctor's doll. When not riffing on the traditions of Western or international art, Erin subverts the human form to make monsters. Some are genuinely bizarre like the Whispering Roots Woman, while others seem carefully constructed to inspire the most fear. They'd fit right in to a Guillermo del Toro movie. Erin will swap out heads for animal parts, tinker with misplaced anatomy, and distort the proportions of his dolls until they are perfect. The best place to view Erin's work outside of a Google image search is his deviantart gallery. His blogs (on blogspot and wordpress), are still up as of this article's publication, but don't display as much of his work. However, this does bring us nicely to the Mystery of Shain Erin! If you thought you liked this guy because of his talent, craftsmanship, and twisted imagination, I've got one more course of dessert to put in front of you. Shain Erin has completely disappeared. As I dug into this artist, to gather information about how they produce their work, their background, and what themes they intend to play with, I found dead end after dead end. Erin used to have an Etsy storefront where he sold his dolls. It's not longer in service. The domain name that he links to from his blogs as his official website (www.shainerin.com) is up for sale. His still-standing blogs haven't been updated for four and a half years. His facebook page hasn't shown any activity since October 1, 2011. In fact, the facebook upload of a photo seems to be his last known communication with the rest of the world. There's even a sad trail of recent messages on Erin's deviantart page asking where he's gone and hoping that he's okay. Aside from the two blogs and the deviantart account, Shane Erin isn't on the internet anymore. Despite the continued attention that his work receives, Erin hasn't come out of the woodwork to display more dolls at art shows, or sell any of his creations. I'm not sure the question will ever be answered, but it must be asked: What happened to Shane Erin? I've been looking also. In a world that has grown so very small due to social media and the such, for this creative soul to have completely disappeared is sadness to the core. Wow I just discovered his work on Pinterest a few days ago..and was amazed at these creepy dolls...so sad to see his has disappeared? I hunted him down and made candle holders out of his skin. The skull, a bowl next to my sink with dried roman in it. His bones are baried under rocks in creek in Baltimore.